It matters on an individual level because all of us will be affected by mental disorder. One in four of us will be diagnosed according to one of the classifications above, so even if this is not you it will be someone you love or someone you work with. Lots of us feel a strange relief when distress is given a name – it suggests understanding, companionship, a removal of uncertainty and the possibility of treatment. However, for many these can easily become self perpetuating and destructive as they have the effect removing responsibility, ownership and eventually hope of recovery, which some never find again. It matters too on a sociological level. Our societies are increasingly regulated by psychiatry. We medicalise, medicate and plan ‘evidence based interventions’ into all sorts of human variation. This may simply amount to the application of science and knowledge to the alleviation of mental illness, but the question is whether this is ‘healthy’? Are we seeking to make a world in which the mess and gristle of life is edited out, tidied away, chemically suppressed? And is it working? Psychiatric classification almost always demands treatment, so step forward the drug companies, with another product to push by fair means or foul. All those countless drug rep funded lunches, gadgets, even holidays, in the name of publicity for the next wonder drug. Even if the drugs do half of what they promise there is no doubt that our population is increasingly medicated. Away from ‘symptoms’ towards understanding that we develop different means of coping with this distress. Away from restrictive labels towards listening to individual experience. Away from medicalised interventions, towards encouragement and support of individual recovery. Away from simplistic distinctions between ‘psychosis’ and ‘neurosis’ towards a greater interest and understanding of the effect of trauma. Away from segregation and ‘otherness’ towards seeing mental distress as an essential part of the human experience and as such, part of all of our experiences. Away from ‘maintenance’ towards hope and acceptance. Critics claim that the American Psychiatric Association’s increasingly voluminous manual will see millions of people unnecessarily categorised as having psychiatric disorders. For example, shyness in children, temper tantrums and depression following the death of a loved one could become medical problems, treatable with drugs. So could internet addiction. Inevitably such claims have given ammunition to psychiatry’s critics, who believe that many of the conditions are simply inventions dreamed up for the benefit of pharmaceutical giants. Psychiatry’s supporters retort that such suggestions are clumsy, misguided and unhelpful, and complain that the much-hyped publication of the manual has become an excuse to reheat tired arguments to attack their profession. But even psychiatry’s defenders acknowledge that the manual has its problems. Allen Frances, a professor of psychiatry and the chair of the DSM-4 committee, used his blog to attack the production of the new manual as “secretive, closed and sloppy”, and claimed that it “includes new diagnoses and reductions in thresholds for old ones that expand the already stretched boundaries of psychiatry and threaten to turn diagnostic inflation into hyperinflation”. Others in the mental health field have gone even further in their criticism. Thomas R Insel, director of the National Institute of Mental Health, the American government’s leading agency on mental illness research and prevention, recently attacked the manual’s “validity”. And now, in a significant new attack, the very nature of disorders identified by psychiatry has been thrown into question. In an unprecedented move for a professional body, the Division of Clinical Psychology (DCP), which represents more than 10,000 practitioners and is part of the distinguished British Psychological Society, will tomorrow publish a statement calling for the abandonment of psychiatric diagnosis and the development of alternatives which do not use the language of “illness” or “disorder”. “Strange though it may sound, you do not need a diagnosis to treat people with mental health problems,” said Dr Lucy Johnstone, a consultant clinical psychologist who helped to draw up the DCP’s statement. In the 1960’s the liberation battles were about race, the 1970’s gender, the 1980’s sexuality. The 1990’s we began to think we had sorted it all out and in the 2000’s we discovered that perhaps we had not. This decade, let us take on the oppressive machine that makes madness out of the variety of human distress. This entry was posted in Uncategorized and tagged Allen Frances, American Psychiatric Association, british psychological society, Diagnostic and Statistical Manual of Mental Disorders, jon ronson, Mental disorder, National Institute of Mental Health, United States by Chris Goan. Bookmark the permalink. Have you read this: http://www.bmj.com/content/339/bmj.b3156 ? Also, did you hear about the people who heard voices who were being encouraged to talk back to them…? In a previous life I spent time with members of what became the ‘Hearing Voices Network’ in and around the Manchester area, and also did CBT training at the place where the early interventions project was being trialed. My fear however is that despite these influential (and controversial) projects, change is very slow. 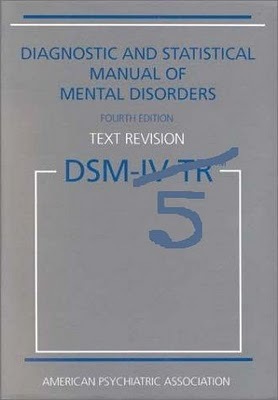 I think a lot of this is to do with the mental illness industry- typified by DSM5. Having said all that- I feel far more comfortable speaking in general terms about labels, causes and treatments of mental illness than I do on an individual basis. People who I have met who are in the middle of a crisis have no time for debates like this- and later, after the machine has taken over, they are faced with a whole different task of survival and recovering who they are. My experience was brief and luckily I came out the other end in one piece. Other members of my family have not been as lucky, but that’s another story for a less public place.